It’s unusual to hear birdsong in November so when I heard a flock singing the other day, I had to investigate. My first problem was finding them. Their voices were faint and far away. Which tree were they in? I walked around listening until I homed in on an apple tree but when I looked at the tree I saw no birds at all. I could hear robins, cardinals, blue jays and… wait… the contact call of a scarlet tanager?!? Scarlet tanagers are in South America now so the only voice that could have uttered that sound was a mimic: a brown thrasher or a mockingbird. Brown thrashers have left Pittsburgh too — they’re in the southern U.S. — so the songster had to be the fellow pictured above. A northern mockingbird. Eventually I found him hiding among the curled, dried, apple leaves, whisper-singing like a hundred different birds. I love mockingbirds. Boyce Mayview park is home to them every year, and it’s fun to try to figure out whether you are hearing the bird whose song it is or a mockingbird when you walk through the park. 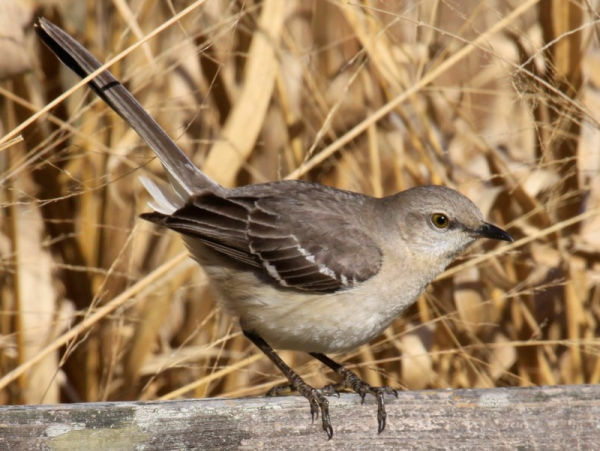 Of course when you hear 5 or 6 different songs in a row come out of the same tree, you know it’s a mockingbird. And especially when you hear the sound of a truck’s backup beeper or a cell phone ring coming out of a tree, you know it’s a mockingbird. I’ve always wondered what the evolutionary advantage was to sounding like a bunch of different birds. Perhaps to confuse predators? But I’d like to know how the birds find mates if they don’t have their own call (or maybe they do; I’m not that knowledgeable about bird calls). When we were in Florida a few weeks ago we heard a flock of them making some very short vocalizations, so perhaps that one was their own. Mine was alone and silent though. Saw him after checking out one of our pererines perched on the north side of the Cathedral maybe a floor or two below the level of their nest box. Checked on the red-tails at CMU…and then as I continued by all the CMU students racing their contraptions around the park this guy came flying across flashing the white bits of his wings and catching my attention. Didn’t know what he was, except that I hadn’t seen one before. Seeing Chuck’s picture here seals the deal. I made the right ID. I hope I get to hear some soon. Whisper singing — do we know why birds do this? I think I read somewhere that birds do this when they are not on their own territory, like migrating through. Is this correct?